KimmyKokonut » Blog Archive » A few meals at home. « Buying locally and supporting more than just the local economy. A few meals at home. I haven’t been carrying my camera everywhere, so you’ll have to excuse the lack of photos of food when we’ve eaten out. But here are a few photos of some of our home-cooked meals, in an unfamiliar kitchen with a hovering hostess…making the process of cooking less than ideal. Breakfast at first (when it was cold) was a lot of oatmeal with strawberry jam. Now that it’s warmed up and I’m not suffering from as many viruses, I’ve started craving fresh fruit with locally produced yogurt. (Just yesterday I found out there’s soy yogurt to be purchased in this town…but we leave tomorrow). The fruit options here are endless and exciting. 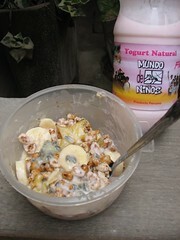 This day we see banana (platano), starfruit (carambola), passionfruit (maracuya) and trigo atomico (puffed wheat). I find it amusing they use atomico for puffed. Puff is such a gentle word, but atomico! Like an explosion of fluffy goodness. Ironically enough, the puffed amaranth here they call kiwicha, sometimes kiwicha tostada. But it’s not toasted seeds; it’s the tiniest baby popcorn in the world. High in protein and delicious. I’ve made it at home before, just heat your skillet until it almost burns (no oil) then throw in a tablespoon of amaranth seeds, cover, and let pop. This little beauty, called Granadilla also made it into my yogurt. I thought it was passionfruit at the market and was surprised that it was NOT acidic like passionfruit is. The goo is clear, unlike passionfruit, which has yellow goo…or whatever that botanical term is (pulp?). The outer skin is a little more orange than passionfruit, but it’s basically the same size. 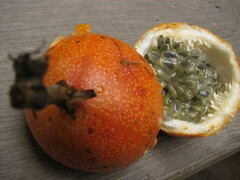 It is in the same genus as passionfruit (Passiflora edulis), but has a different species name (Passiflora ligularis). My dictionary lists granadilla as the feminine fruit and maracuya as the masculine..but they are two unique fruits to me. Granadilla has vitamins A, C, and K, phosphorus, iron, and calcium. I was informed by a local that it is good for babies’ finnicky and sensitive tummies (just make sure you make a juice from it and strain the seeds…we don’t want any choking babies out there on my account). Maybe I should make a batch for my unhappy tummy as well. 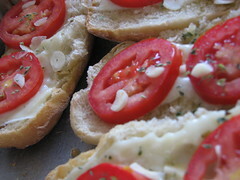 For our lunch (actually we have multiple variations of this meal because it is so simple and tasty) we indulged in the processed mozzarella cheese to make some bruschettas. This picture has some fresh tomatoes, olive oil, oregano, garlic and the cheese. The market was sold out of basil, but that would have topped it off perfectly. The basil here (albahaca) is big and beautiful and pungently delicious. I made a caprese sandwich for a day trip one day and it stunk up the whole combi with goodness.